2012-2013 Top Club of the District! 2011 Service Organization of the Year! Come Join us and help service your community! We meet at Qube Restaurant in San Mateo at 4000 South El Camino Real on 2nd Thursdays at 7 PM. Links open to external windows. Congratulations to Lions Eleanor Szeto and Lou Himenes for being honored as Lion of the Year for 2017-2018! 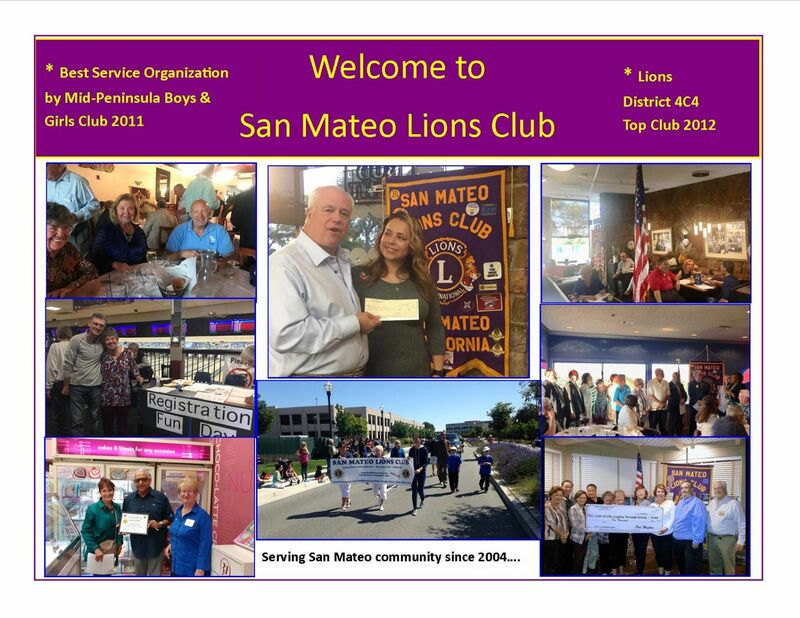 San Mateo Lions is a community service club dedicated to raising donations and providing volunteer service to a variety of Lions Clubs International and local charitable causes. The primary fundraising project in our organization is Campaign SightFirst II, a global effort to raise $150 million to support the SightFirst program in it efforts to treat and prevent blindness. Other charitable causes of our club include service to the homeless and needy at the Maple Street Shelter and Samaritan Houses, used eyeglass collections from the community for Lions in Sight charity, volunteer service to City of San Mateo Senior Center for their annual Health Fair, and a variety of other causes noted on our Charities page. At our meetings, we often have a local charity representative come speak to our members about their programs and financial needs. For example, we had an individual come speak to us about a specially-designed handicap-accessible playground for children with special needs. If you know of a charitable cause we are not currently supporting, your participation in our membership can help bring awareness to your cause. All American Self Storage at 2000 East 3rd Avenue, across from the Seal Park Dog Run, cross street and access to entrance is Detroit Drive. Home - Front page of Site. Calendar - Listing of our club events and pertinent events of the Distict. Flyers of events posted where applicable. Club Projects - Learn about service projects and charitable causes. Photo Gallery - A built-in template for the site. We are limited to only 10 photos for this Page, so we added a page for links to our online galleries on our Multimedia Page. Contact Us - Club contact info and meeting location contact info. Multimedia - Links to our online photo galleries of our current and past events, current and past club Newsletters in PDF format, and links to our both San Mateo LIons Club and LCI YouTube Channels for club and Lions Club Intnernatonal videos. Links - Links to Lions Clubs Web Sites, SMLC Charitable Progam Web Sites, SMLC Meeting Venue Web Sites, Web Sites from our Program Speakers, and other Web Sites of Interest to our members and guests. 2018-2019 Club Officers - Listing of current club officers and past presidents. Ways to Make a Difference - Our Donation Page, which will include details on our current ways for members and supporters of SMLC to donate to our club projects and events. Last Updated: April 12, 2019. Updated Calendar to show next fundraiser as feature event for Home page. Updated Officers Page to show revised 2019-2020 Slate of Officers to be elected at our May club meeting. For visuals of our Lions in action, please check out Facebook page, www.facebook.com/SanMateoLionsClub and Lion Michael's photo gallery.